In geometry, a paraboloid is a quadric surface that has (exactly) one axis of symmetry and no center of symmetry. The term "paraboloid" is derived from parabola, which refers to a conic section that has the same property of symmetry. There are two types of paraboloid, elliptic and hyperbolic, depending on the nature of the planar cross sections: a paraboloid is elliptic if the cross sections orthogonal to the axis of symmetry are ellipses; hyperbolic if those cross sections are hyperbolas. Cross sections of both types parallel to the axis of symmetry are parabolas. Equivalently, a paraboloid may be defined as a quadric surface that is not a cylinder, and has an implicit equation whose part of degree two may be factored over the complex numbers into two different linear factors. The paraboloid is hyperbolic if the factors are real; elliptic if the factors are complex conjugate. where a and b are constants that dictate the level of curvature in the xz and yz planes respectively. In this position, the elliptic paraboloid opens upward. In this position, the hyperbolic paraboloid opens downward along the x-axis and upward along the y-axis (that is, the parabola in the plane x = 0 opens upward and the parabola in the plane y = 0 opens downward). Any paraboloid (elliptic or hyperbolic) can be considered as a translation surface in the sense of differential geometry. It can be generated by a moving parabola directed by a second parabola. With a = b an elliptic paraboloid is a paraboloid of revolution: a surface obtained by revolving a parabola around its axis. 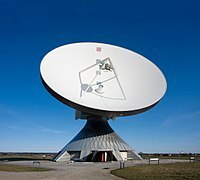 It is the shape of the parabolic reflectors used in mirrors, antenna dishes, and the like; and is also the shape of the surface of a rotating liquid, a principle used in liquid mirror telescopes and in making solid telescope mirrors (see rotating furnace). This shape is also called a circular paraboloid. There is a point called the focus (or focal point) on the axis of a circular paraboloid such that, if the paraboloid is a mirror, light from a point source at the focus is reflected into a parallel beam, parallel to the axis of the paraboloid. This also works the other way around: a parallel beam of light incident on the paraboloid parallel to its axis is concentrated at the focal point. This applies also for other waves, hence parabolic antennas. For a geometrical proof, click here. an ellipse or a point or empty, if the plane is not parallel to the z-axis. a point, if the plane is a tangent plane. Obviously, any elliptic paraboloid of revolution contains circles. This is also true, but less obvious, in the general case (see circular section). Remark: an elliptic paraboloid is projectively equivalent to a sphere. The hyperbolic paraboloid is a doubly ruled surface: it contains two families of mutually skew lines. The lines in each family are parallel to a common plane, but not to each other. 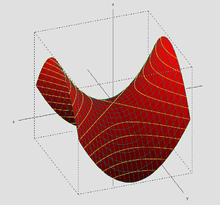 Hence the hyperbolic paraboloid is a conoid. These properties characterize hyperbolic paraboloids and are used in one of the oldest definitions of hyperbolic paraboloids: a hyperbolic paraboloid is a surface that may be generated by a moving line that is parallel to a fixed plane and crosses two fixed skew lines. This property makes it simple to manufacture a hyperbolic paraboloid from a variety of materials and for a variety of purposes, from concrete roofs to snack foods. a hyperbola, if the plane is not parallel to the z-axis and not a tangent plane. A hyperbolic paraboloid is a ruled surface (contains lines), but not developable (in this case it is unlike a cylinder or cone). The Gauss curvature at any point is negative. Hence it is a saddle surface. after a rotation around the z-axis with an angle of 45° degrees. A hyperbolic paraboloid is projectively equivalent to a hyperboloid of one sheet. , which is a parabolic cylinder (see image). which are both always positive, have their maximum at the origin, become smaller as a point on the surface moves further away from the origin, and tend asymptotically to zero as the said point moves infinitely away from the origin. which can be thought of as the geometric representation (a three-dimensional nomograph, as it were) of a multiplication table. which is the analytic continuation of the ℝ → ℝ parabolic function f(x) = x2/2. where F is the focal length, D is the depth of the dish (measured along the axis of symmetry from the vertex to the plane of the rim), and R is the radius of the rim. They must all be in the same unit of length. If two of these three lengths are known, this equation can be used to calculate the third. where ln x means the natural logarithm of x, i.e. its logarithm to base e.
^ Thomas, George B.; Maurice D. Weir; Joel Hass; Frank R. Giordiano (2005). Thomas' Calculus 11th ed. Pearson Education, Inc. p. 892. ISBN 0-321-18558-7. ^ Thomas, George B.; Maurice D. Weir; Joel Hass; Frank R. Giordiano (2005). Thomas' Calculus 11th ed. Pearson Education, Inc. p. 896. ISBN 0-321-18558-7. ^ Zill, Dennis G.; Wright, Warren S. (2011), Calculus: Early Transcendentals, Jones & Bartlett Publishers, p. 649, ISBN 9781449644482 . ^ Wyman, Carolyn (2004), "Pringles potato chips: A new use for tennis ball cans", Better Than Homemade: Amazing Foods that Changed the Way We Eat, Quirk Books, pp. 47–49, ISBN 9781931686426 .